Does your current pillow leave you feeling unsatisfied? Do you mostly wake up with aches and pains on your back and neck? Consider replacing your uncomfortable pillow with a high-quality orthopedic pillow. For this reason, we have put together this detailed guide for the Shredded Memory Foam Pillow by Xtreme Comforts. This pillow offers superior quality, comfort, support, and durability. In fact, we think it is one of the best pillows on the market today. Let’s take a look at the positives, negatives, and everything else you need to know about this pillow. Running low on time? Click here to skip the review and go directly to the product page on Amazon.com. What Are The Key Takeaways With The Shredded Memory Foam Pillow? The Shredded Memory Foam Pillow by Xtreme Comforts utilizes granulated memory foam in a zippered pouch, making it extremely easy to inflate once it arrives at your home. It is through the pouch’s opening that the memory foam filling is reduced or increased to adjust the pillow’s loft upwards or downwards. 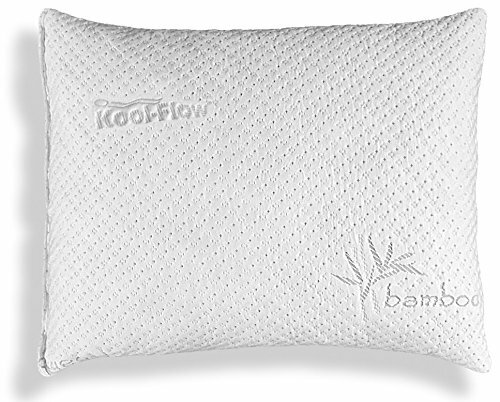 The pillow’s shredded memory foam pouch is inside a removable super soft bamboo cover for ease of use. This bamboo cover is thick with a dotted Kool-Flow design to increase its breathability. It also has double stitched seams sewn to the inside on all sides except for the closing seam that faces outside. This firm stitching keeps the cover intact for a long time. The Shredded Memory Foam Pillow by Xtreme Comforts retails in three different sizes. There is also a Slim-sleeper variation for the King, Queen, and Standard sizes whose loft measures 5 inches instead of 7 inches when fully inflated. The Slim-sleeper variation is not adjustable. Shredded Memory Foam Pillow targets back and some side sleepers with this slimmer design. Both the cushion variations are much longer than other pillows that have an average length of 20 inches. This extra size caters for most body shapes (especially broader shoulders) and preferences. The pillow comes with extra foam filling. Therefore, the user can opt to add or reduce the pillow’s foam filling to the desired firmness. Due to this adjustability, the pillow is customizable to various thickness levels to fit all sleeping positions. With such a cushion, there is no need to stack two or more pillows for comfort, making it much easier to sleep at night. The Shredded Memory Foam Pillow by Xtreme Comforts. utilizes a soft bamboo fabric cover. Additionally, its shredded memory foam creates numerous air pockets resulting in soft and fluffy cushions that quickly bounce back after use. This bounce is unlike other regular memory foam cushions that feel tight and packed under a lot of weight. The shreds get rid of the heat retention problem associated with regular memory foam. This easy to shape pillow has the feel of a feather or down pillow without the expensive tag associated with such premium quality. The pillow does not slide off leather or other slippery surfaces. It is virtually silent when compressing to contour to the user’s body curves. The Shredded Memory Foam Pillow is useful in the house or office in many ways. They offer excellent knee support when doing yoga and meditation. They adjust nicely around seat belts to offer riders a place to lean on when traveling for long hours. The extra filling from the pillow is excellent stuffing for a pet’s cage or as a draft blocker. Both the Shredded Memory Foam Pillow and its cover comprise of 43% bamboo fabric. This fabric has natural antimicrobial properties that are safe around the eyes, nose, and mouth. By creating an inhospitable environment for bacterial growth, this fabric prevents bacterial build up. The pillow has a high moisture absorbency level and features various micro vents. Hence, it does not pile up sweat or dust. A hot sleeper will particularly benefit from the pillow’s ventilated memory foam. 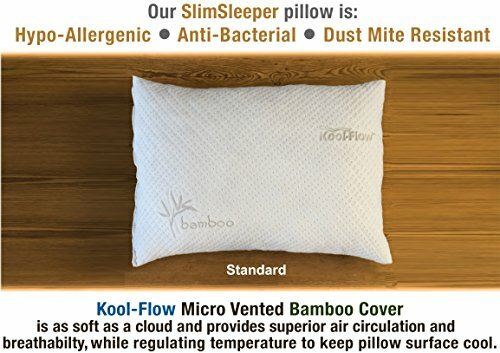 Its breathability coupled with the thermal-regulating properties of the bamboo cover ensures the pillow’s surface stays cool throughout the night. There are no unwanted chemicals used in the making either the pillow or its cover. To back this up, all the materials used in making the Shredded Memory Foam Pillow by Xtreme Comforts are CertiPur-US Certified. 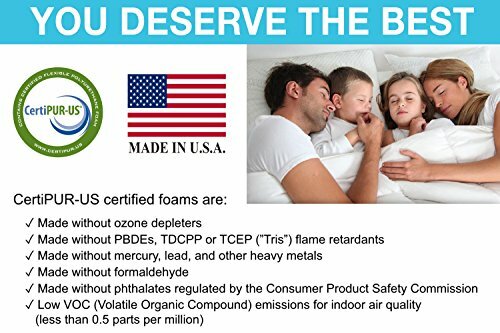 This certification assures the user that the pillow is free from heavy metals such as mercury, lead, PBDEs, ozone depleters, phthalates, or formaldehyde. It is also a guaranteed of the low level of volatile organic compounds (VOCs) that are permissible for indoor air quality (less than 0.5 parts per million). With such excellent hypoallergenic, moisture-wicking, and antimicrobial properties, there is no need for an additional pillowcase unless you want to add some aesthetic value. For those who add an extra pillowcase, use a 240-thread count pillowcase. 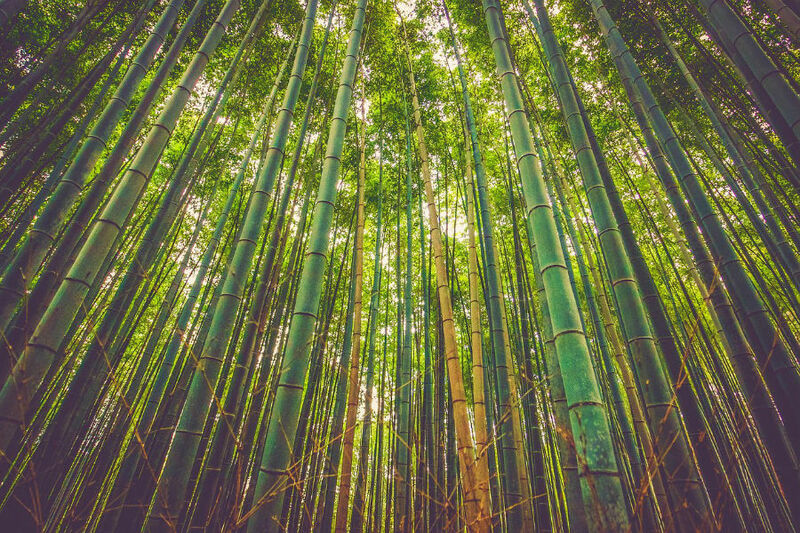 It is best suited to complement the bamboo cover. 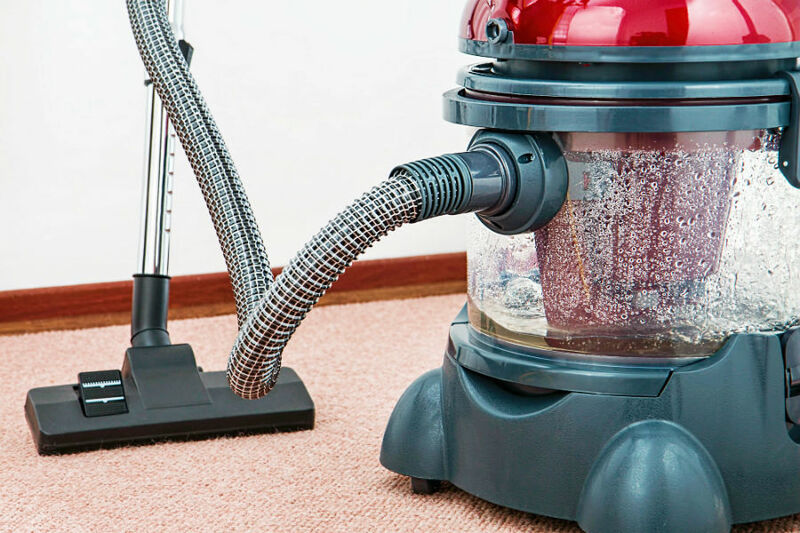 Dust mites are common in most homes. They can be a nuisance, especially in humid areas. Even though this creepy crawlies don’t bite or transmit diseases (they feed on the dead skin cells on the pillows), they can cause itchy eyes, sinus flare-ups, rashes, and hives. The Shredded Memory Foam Pillow by Xtreme Comforts prevents the accumulation of dust mites and moisture resulting in improved health of the user. Unlike other pillows, the Shredded Memory Foam Pillow will not put stress on the nerves, restrict blood flow, bend airways, or make breathing difficult. 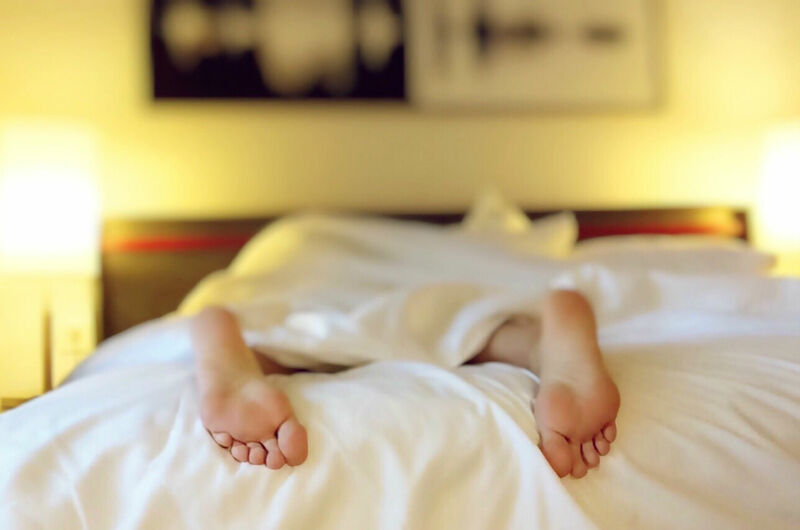 Persons dealing with acid reflux, insomnia, post-nasal drop, snoring, migraines, coughing, allergies, and asthma, and back pain worsen their conditions when they lie flat on their backs. This pillow elevates the torso, aligns the neck, spine, and airways, and therefore, allows the sleeper to have a good night sleep. It eliminates pressure points resulting in less fatigue when waking up. The pillow can be used either horizontally to lift the back, vertically when lounging on a seated position, or even as leg support. Unlike the belief that one’s sleeping position will dictate the pillow of choice, the Xtreme Comforts Shredd Memory Foam Pillow is a one-pillow-fits-all type of pillow. It attributes this to its adjustability feature. For a stomach sleeper, the pillow’s density is adjustable to medium level to support both the shoulders and the neck. The pillow quickly contours to the side of the user’s face enabling him/her to wake up feeling rejuvenated. For a back sleeper, this pillow can be made firm to support both the neck and head for optimal alignment. By so doing, it relieves the strain on the neck allowing the sleeper to breathe deeply. Finally, for a side sleeper, the pillow’s density is adjustable to an even firmer level to provide that extra support between the shoulders and the neck. When the side sleeper puts the pillow in a hugging position, it supports his/her back. The Shredded Memory Foam Pillow is tough enough to withstand everyday use. And, even though the memory foam used tends to get softer with age, it will not form any permanent impressions over time. 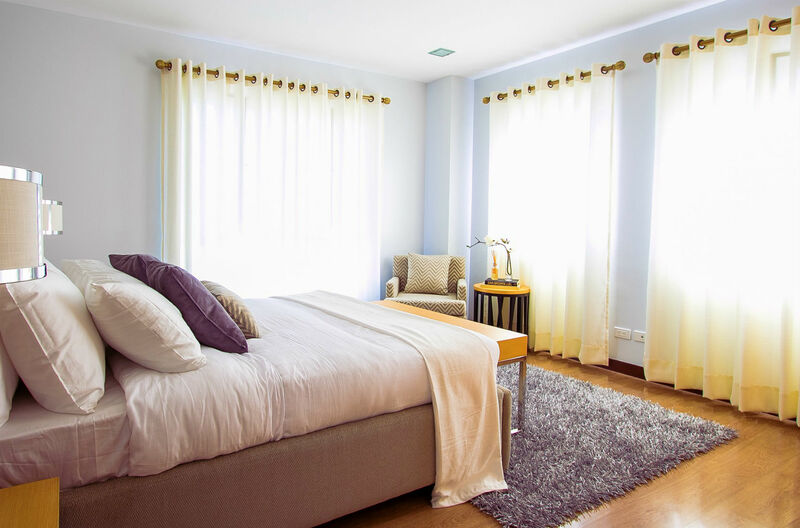 Instead, as a daily routine when making the bed, toss the pillow up and down to make it regain its original shape. Even when it goes flat overtime, all that is needed to get it back into shape is to fluff it up or toss it in the dryer. This action will make the memory foam pieces to rebound into their original fluffiness. The Shredded Memory Foam Pillow by Xtreme Comforts comes with a 30-day money back guarantee. 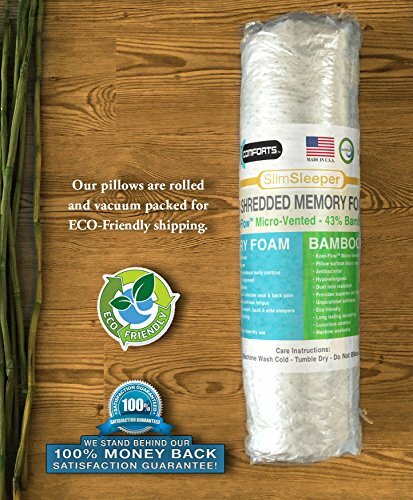 The Shredded Foam Pillow by Xtreme Comforts comprises of environmentally friendly memory foam and organic bamboo fiber free of flame-retardants or toxic chemicals. In addition, they ship the pillow in a vacuum-sealed Eco-friendly packaging. Therefore, after you open your package, you have less to worry about disposing of the packaging. Once the Shredded Memory Foam Pillow arrives in a compressed packaging form, all you need to do is to fluff it up by hand. You then let it settle for a few minutes before using. The pillow will re-inflate to its normal plumpness. To get it back to its compressed form, you need to flatten and roll it up tight to fit a small packaging. This easiness of deflating and inflating the pillow makes it an ideal travel mate. 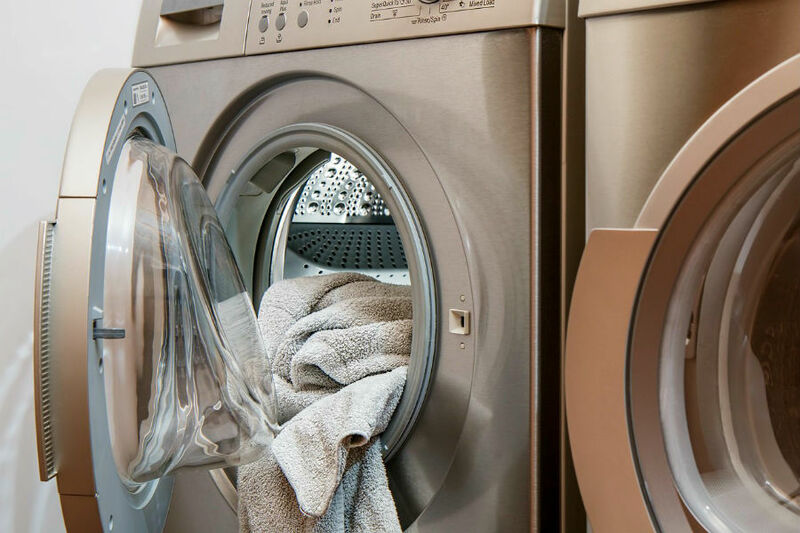 As a rule of thumb, products made of memory foam products need to stay away from water. The reason behind this belief is that memory foam tends to break down and lose its resilience and luster when in contact with liquids. Besides, most of these pillows are cumbersome to wash.
Users tend to, therefore, resort to washing only the pillow cover. This zero-contact with water is never the case with the Xtreme Comforts Shredd Memory Foam Pillow. Both the pillow and its cover are fully machine washable. Because the memory foam is shredded, it can withstand many washes without being damaged. To wash the pillow, just toss it together with its bamboo cover into the washing machine and follow the manufacturer’s washing instructions. Afterward, dry it in the sun or use a dryer. It will regain its original shape and fluffiness. Xtreme Comforts recommends washing the pillow after six months of use. The ability to wash the pillow without compromising its desirable features assures the user of a better hygienic sleeping area. Despite the many benefits associated with the Shredded Memory Foam Pillow by Xtreme Comforts reviews, this pillow tends to have off-gassing. Off-gassing happens because the memory foam pillow comes in a vacuum-sealed airtight packaging directly from the factory. When you open the packaging, it needs at least 30 minutes to air or a few minutes in the dryer to get rid of the strong smell. Secondly, in general, memory foam tends to be denser than other materials. This pillow is not the type you would enjoy using in a pillow fight teasing game. Such memory foam based cushions weigh more than other pillows in the same category. The weight increases further when the pillow gets wet. It also takes longer to dry. Thirdly, the pillow’s adjustability takes time to master. The user has to try several levels of thickness to achieve the right level of comfort. The user may have to tolerate a thicker, softer, and sometimes plush density until he can finally customize his sleeping experience. Fourth, the pillows shredded foam fillings are static-laced. They tend to stick to anything they touch. Because of this, the need to remove or add back the foam filling can get quite messy. The level of comfort that users get from using this pillow depends on their weight, height, health, and personal preference. 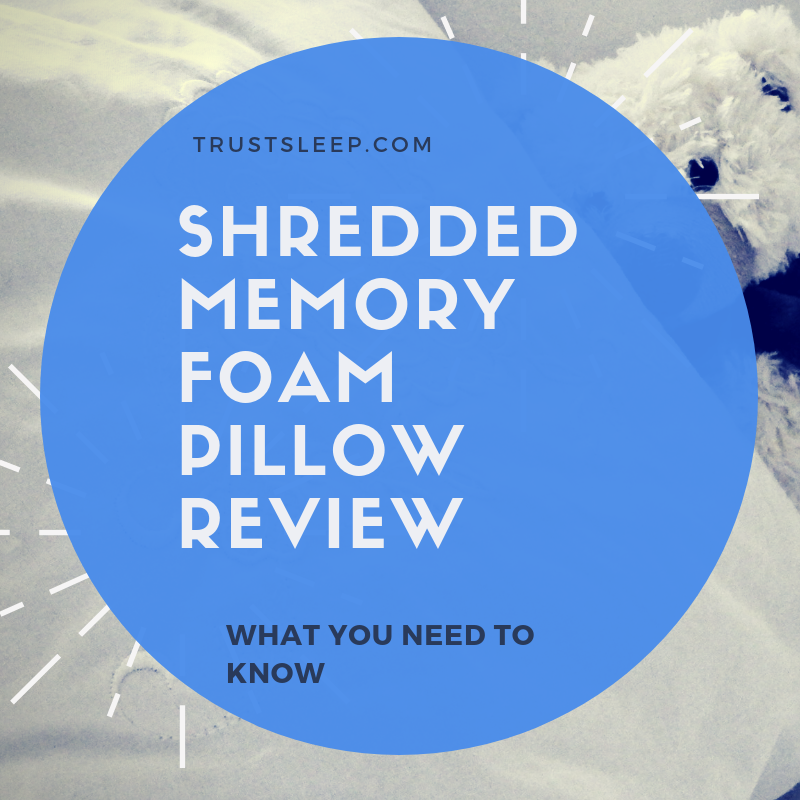 We mentioned in this Shredded Memory Foam Pillow by Xtreme Comforts review that it comes in two types. The 5 inches and 7 inches loft for the two pillow sizes is within the recommended minimum range of 4 to 6 inches. The additional width in the 7-inch cushion caters for adjustments to customize it to the preferred comfort level. Anyone seeking relief from respiratory-related ailments finds the pros to far outweigh the cons. In general, the benefits of the Shredded Memory Foam Pillow from Xtreme Comforts tend to fit the needs of more sleepers than any other pillow. Its unique design is safe, functional, and a great pillow for all people. We highly recommend it. Shredded Memory Foam Pillow by Xtreme Comforts is a fantastic, high-quality memory foam pillow that has a lot of phenomenal features such as adjustability, supreme comfort, quality manufacturing, eco-friendliness, and more. Additionally, there are very few real downsides ot using this pillow. We highly recommend picking it up. If you do, feel free to leave a comment below to let us know how you are liking it. We hope you enjoyed reading this review and we hope you found it useful. Sweet dreams! 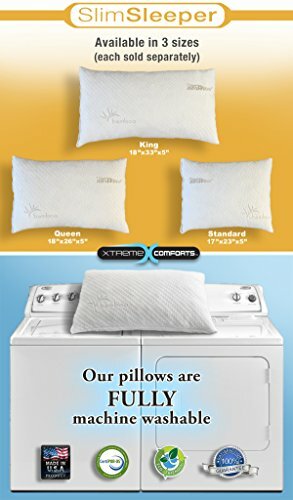 Click the button below to purchase Shredded Memory Foam Pillow by Xtreme Comforts on Amazon.com.